It's so easy to get into a rut. Of course it can be a 'nice rut' and you may not mind being in it. For example over the past few years I have spent quite a lot of time fishing for bass with fly gear. In fact, for a couple of years the bass fed at the surface so regularly that it would have been stupid to ignore them. The problem about this is the approach. The bass that I am after are actually feeding on Coelopa maggots. To catch these all they have to do is swim quickly to the surface of the sea, grab a mouthful and go down again. When they are feeding like this you can, of course, catch them by using an artificial floating maggot. However, it is often more productive, and seems to pick out better specimens if you use a small fry fly or streamer (or a plug or popper for that matter). The down side of catching bass on 'fishy flies' is that you don't catch much else. Even if there are mullet feeding with the bass (they often are and they may be big fish) you could drag your streamer flies through them for weeks without inducing so much as a sniff. 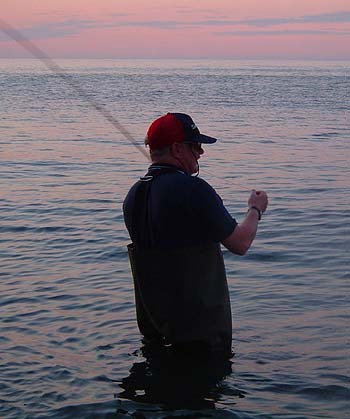 Recently I was fishing with Nigel one evening. We'd plugged away for a while and then fish began to feed on the surface so we switched to the fly. No joy! 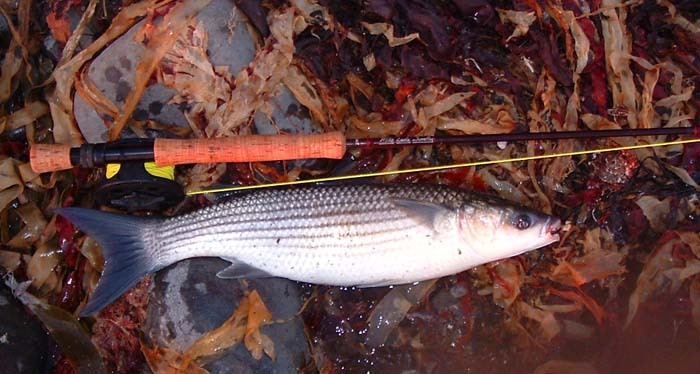 It soon became obvious that virtually all the surface feeding fish were mullet. I searched through the tackle bag and found my poly flies. Now it's ages since I used them and the only worthwhile specimens were some tied last year. They were nice neat jobs but as it turned out they had a fatal flaw - they did not float!!! They only sank slowly but experience has shown that once under the surface your chance of bites from mullet is often vastly reduced. 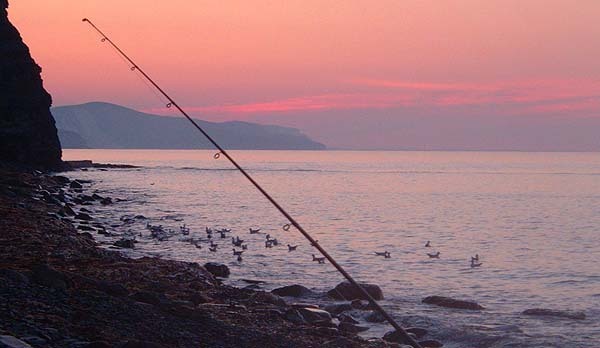 I fished without result for five or ten minutes then I decided that urgent action was required if I was to catch a fish before the tide turned and they departed. I had a bit of spare 'Ethafoam' in the box so I ripped a piece off the block and hitched it (with a reef knot) to the line just by the eye of my fly. This looked crude but it certainly kept the fly afloat. I baited up with four maggots, cast to a shoal of feeding fish and waited - with bated breath (and baited hook). A fish approached the little bobbing fly, sucked it in, I raised the rod and it was on! What a battle! Although I've caught thousands of them I'd almost forgotten what powerful fish mullet are. The mullet surged away time and time again. For five or ten minutes I hopped along the rocks with the rod held high. Nigel, in the water, tried to get behind the mullet and shepherd it onto the beach (as usual I had no net) but it would not come to hand. It was an exhilarating experience for both of us. Fortunately my improvisedy hitch knot in the six pound cast held and there were mighty sighs of relief when, at last, the mullet was landed - what a fish! The first thing I did on returning home was to tie some proper (floating) maggot flies. On the next set of tides I'll be after the mullet again (If they turn up! ).